The two questions that surrounded the lead up to the Sergio Mora-Abraham Han fight. Would the cancellation of Mora’s scheduled challenge of IBF Middleweight world champion Jermain Taylor have any effect on his focus as he prepared to face Han. As well, could seize the opportunity to make a name for himself in the talent deep Middleweight division after stepping in to face Mora. Those questions were answered when Mora and Han met for the vacant USBA Middleweight title on February 6th at the Beau Rivage resort and casino in Biloxi, Mississippi. The story throughout much of this fight was Mora’s lateral movement, ring generalship, and ability to land the cleaner more effective punches. Although Mora was not always the aggressor, he was able to make the most out of the offense he put forth. The change in opponent and what had to be disappointment due to missing out on an opportunity to become a two-division world champion did not seem to have much effect on Mora, who has previously held the WBC Jr. Middleweight world championship in his career. Mora however, did face a fighter in Abraham Han who was very “Game” and who was able to rally late in the fight including scoring a knockdown of Mora in the tenth round. Han was able to make the fight close as after the conclusion of the twelve round title bout the three official judges rendered a split decision. One judge scored the fight in Han’s favor 115-112, while the two other judges saw the fight 114-113, and 115-112 for Mora. Although I felt that Sergio Mora won this fight convincingly as I unofficially scored the fight 117-112 in his favor, it was a competitive fight from beginning to end. The primary difference in this fight was Mora’s ability to execute his offense in spurts and in particular how effective he was in landing his right hand throughout the fight. This along with his ability to be an elusive target and make Han miss often, despite his aggressiveness was the basis of my score. It is understandable however, how some could feel that Han was able to win more rounds due to his aggression. This was a case where the question was whether simply being more aggressive would be enough to win the fight while not necessarily being effective. Even though Han came out of this fight on the losing end, he was able to give a good account himself and it would not surprise me if he were able to secure a fight against someone in the top ten in any of the sport’s respective sanctioning organizations. The Middleweight division is very deep and Han would be an interesting opponent for any of the top contenders in the division. As for Sergio Mora, the question is what will his win over Han mean for him in the long-term. It was announced prior to the fight between Mora and Han that the International Boxing Federation (IBF) had stripped Jermain Taylor of its Middleweight world championship and that the sanctioning organization would mandate a fight between it’s number one contender Hassan N’Dam and it’s number three contender Felix Sturm for the vacant IBF championship. This however, will apparently not be the case as it has been announced that Felix Sturm will decline the opportunity to fight for the IBF championship in favor of moving up in weight to the 168lb. Super- Middleweight division. Sturm’s intention to move up in weight with his sights on a potential fight with current WBO Super-Middleweight world champion Arthur Abraham now leaves a question of who will fight N’Dam for the vacant IBF Middleweight championship. One possible scenario could be that the IBF could award the title to N’Dam seeing as he did win an elimination bout, defeating Curtis Stevens in October of last year for the number one ranking in the IBF’s Middleweight ratings. It would not be the first time that a top contender has been named champion, as fighters who have held interim champion status in other organizations respective ratings have been elevated to champion. If such a scenario were to come to fruition an argument could be made that either N’Dam would be mandated to defend his title against a top contender or the IBF may hold another elimination bout between two top contenders to determine a new mandatory challenger. An interesting question is what would this mean for Sergio Mora? As I stated last week prior to Mora’s fight with Abraham Han, it is important to remember that Mora, who entered the fight with Han rated number fourteen in the IBF’s Middleweight ratings, was in line to challenge for the IBF world championship prior to the cancellation of his fight with Jermain Taylor. The fight with Han was for the United States Boxing Association (USBA) Middleweight title. Mora’s victory over Han has elevated his ranking in the IBF ratings to number seven. In this observer’s opinion, seeing as the USBA is a regional title under the umbrella of the International Boxing Federation, it makes sense that Mora should be in line to fight for the IBF title off of his recent victory. Although fighters such as Sam Soliman, David Lemieux, and Billy Jo Saunders are rated above Mora currently in the IBF Middleweight ratings, it is important to note that Saunders is currently the number one contender in the World Boxing Organization’s (WBO) ratings and there is no word as of this writing as to what the future plans might be for Soliman and Lemieux. Based on this and Mora having previously been scheduled to fight for the IBF world championship, I believe he should be in line to fight for the vacant title. An interesting question is how will all the circumstances surrounding the IBF Middleweight world championship impact the rest of the division. 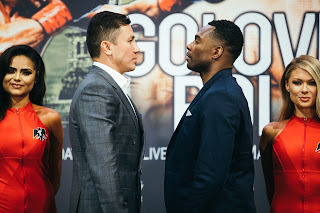 For now, the attention of the division will focus on unified WBA/IBO Middleweight world champion Gennady Golovkin’s title defense against top contender Martin Murray on February 21st. If Sergio Mora is not in line to fight for the vacant IBF championship in the near future, it will be interesting to see whether he could be a potential future opponent for the winner of the Golovkin-Murray fight. The sport of Boxing is after all a sport of opportunities. For a fighter who was going to have an opportunity to fight for a world title and who unfortunately missed out on that opportunity due to circumstances that were beyond his control, he was able to make the most out of a disappointing situation and elevate his standing as a top contender. Whether or not Sergio Mora will get the opportunity to fight for a world title in a second weight class remains to be seen. In my opinion, he has earned the title shot. Is Cotto Next For Golovkin? Can Mora Remain In Line For A Title Shot?